The headline was stripped across the top of the printed local news section of today’s Las Vegas Review-Journal. “The ‘Pathfinder’ returns to town,” it read, touting the opening of a laudatory touring exhibit about the life of 19th century military opportunist and politician John C. Frémont (1813-1890). Always good copy, he was dubbed by the press of the era “The Great Pathfinder” for the maps generated under his watch of the American West, which helped the United States literally expand from sea to shining sea. To me, Frémont was something else–a war criminal, and not just once, either. With that and some of the other stuff in his background, I have not understood why he is as celebrated and so uncritically examined as he is. Streets, neighborhoods, whole cities, schools and a slew of other governmental buildings have been named for him, mainly in the West. In Las Vegas–an area he first visited, for less than a day, in 1844–a part of Fremont Street is a popular tourist venue, home of the Fremont Street Experience. Fremont Street is the site of Nevada’s first legal gambling facility, the original home of the World Series of Poker and the city’s second best-known artery after Las Vegas Boulevard, a/k/a The Strip. Frémont, a Georgia native born out of wedlock, was expelled from military college for bad attendance. Nevertheless, he eventually joined the Army. Frémont proved to have a terrific sense of P.R. and tremendous amount of luck. It also helped he married very, very well. His wife was Jessie Benton Frémont, the 17-year-old daughter of a powerful U.S. Senator from Missouri. She did a lot of P.R. and editing work for him, and ran political interference for him while her dad helped get him plum assignments. With matinee-idol looks and a big ego, Fremont rose to the rank of major general. He cultivated the press and got fabulous coverage. He may have been the country’s best known military officer. The hacks labeled Frémont “The Pathfinder” or even “The Great Pathfinder” for his mapping (and spying) expeditions across the West. Generally, it was his equally famous sidekick, Kit Carson, doing most of that pathfinding. However, it cannot be denied that Frémont had a way with words; it was he who dubbed the entrance to San Francisco Bay the Golden Gate. One of those trips brought Frémont on May 3, 1844, to the future Las Vegas, then an essentially unpopulated desert oasis whose spring waters, he wrote, were too warm for drinking but wonderful for bathing. (It is at the Nevada State Museum, Las Vegas, located at the site of those water sources, now called the Springs Preserve, where the touring exhibit, “Finding Frémont,” will be staged for a full year.) Vegas was on the Old Spanish Trail–yes, Frémont bestowed that name, too–connecting Santa Fe, N.M. and Los Angeles. A map and report he put together that Congress published guided thousands of settlers to the West, especially a few years later in the aftermath of the 1848 discovery of gold in California. There was one small problem with Fremont’s travels. Much of the West was still part of Mexico, meaning Frémont essentially was a spy gathering military intelligence. But that was about to change, thanks to U.S. President James K. Polk’s policy of “manifest destiny.” That was the belief in a God-given right that the United States, then confined to the eastern half of North America between Canada and Mexico, should grab the other half, especially California. Latinos and Indians were to be swept away and replaced by gringos. Polk’s plans were another good example of Frémont’s uncanny ability to be in the right place at the right time. In early 1846 Frémont and his well-armed “topographical engineers” were poking around Northern California when Polk, undoubtedly America’s most effective one-term president ever, decided to act. 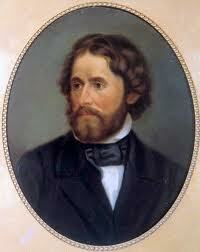 Mexican military authorities had chased Frémont and his men north to Oregon outside of Mexican jurisdiction. Polk sent a courier with orders for them to return to California and await the start of the Mexican War. The Mexican War was still continuing when Frémont’s soldiers reached San Rafael, just north of San Francisco. His troops spotted three innocent, unarmed Mexican settlers–an elderly man and two nephews–crossing a waterway toward them. Frémont peered through a telescope watching the small boat as it neared his shoreline. Frémont waved his hand. “I have no room for prisoners,” he replied, according to a witness account he never, ever disputed. So using their rifles at point-blank range, the man after whom Nevada would name its capital city, Carson City, and two soldiers eagerly gunned down the defenseless Californios. They then reported back to the Great Pathfinder what they had done. “It is well,” he proclaimed. His soldiers then stripped the dead bodies of all clothing. Frémont turned away one dead man’s son who asked for return of his father’s poncho. The rest of the Mexican War burnished Frémont’s reputation as a man of action, if nothing else. He quickly captured largely Monterey, the Mexican military capital of California south of San Francisco, which was pretty easy going since Mexican authorities had abandoned it. He then sailed down the coast toward Los Angeles. What happened next wasn’t so easy. Frémont and his troops were forced to retreat by outraged civilians who were better shots. But in early 1847 he returned, signing (without any authority whatsoever) the cease-fire that essentially ended the Mexican War and firmly brought California (and what became Nevada) under U.S. control. Frémont later was court-marshaled, not for the massacres, but for insubordination, essentially showing up his superiors. On the side, he bought a 44,000-acre ranch near California’s Yosemite Valley (using inside information he gained while surveying the land for the military) from someone who did not have clear title. When gold was discovered in the vicinity, he worked to alter the boundaries of the defective deed to cover some of the gold lands and evict miners already at work there. In 1850 Frémont became one of California’s two inaugural U.S. senators, chosen by a state legislature dominated by Yankee carpetbaggers. But he spent so much of his time in Washington attending to his land holdings and other business interests that disgusted lawmakers denied him another term. For the Civil War, which began in 1861, Frémont rejoined the military on the Union side. But fellow Republican Abraham Lincoln fired him for grandstanding on the issue of slavery; Frémont wanted to push for abolition far faster than his Commander in Chief. After the war, Frémont peddled worthless bonds in Europe for a dubious U.S. railroad (he was convicted in absentia of fraud in France and sentenced to five years, which he never served), blew through his gold fortune and went bankrupt. He was appointed governor of the territory of Arizona but was forced to resign because, among other deficiencies, he was almost never there. He died in 1890 broke but famous and celebrated in many, many circles, including the future City of Las Vegas. Yet he is buried not in the West he so carefully explored–and committed massacres in–but in a suburb of New York City. Return of the Great Pathfinder to Las Vegas? All I can say is, watch your head and watch your wallet.